Round `em up! This here "Cowboy" goffins needs a new place to kick up his feet a little. Got a little room at your ranch, a um, home? 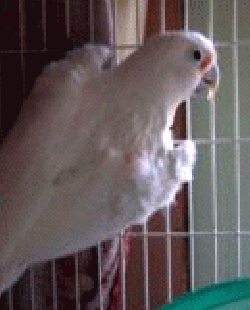 Howdy ya`all- I`m Cowboy, a goffins cockatoo. I`m a bit of a free spirit so someone with big bird experience may be the best new owner for me. My previous owner did not want to give me up, but I was a bit hard for him to handle. I`m not a bad boy, mind you; I`m just a bit strong-willed is all. Goffins are active, smaller, cockatoos that have personality plus! I`ll need a pretty large cage with lots of toys and stuff to play with and chew up. I, as the rest of my breed, have a rather loud squawk when we are calling to you as well as at dawn and dusk. I`m a good looking dude though, if I say so myself and I do like human company. You`ll just need to pull in my reins though if I start to get a bit out of hand or try to rule the roost. Our cockatoo coordinator is really good at matchmaking so if you think we might click give her a call. She`ll give you the scoop on me, chat with you, and see if she thinks we are fit to live together. I`ll be waitin` to hear from ya partner.